Much as I’d like to, I don’t get that many repeat housesits with favoured clients, simply because I’m booked at the times they want. The tyranny of distance also plays a part as a lot of Sydney and New South Wales homeowners would gladly have me back, however, I had to turn a few down when I took off to Brisbane in early 2016. But Samantha and Dan from Wavell Heights got in very early after I spent a month there in July 2016, and booked me in for just the week in July 2017. It came at the end of a whirlwind two and a bit months on the Sunshine Coast, Gladstone, Rockhampton, Cairns, and Yeppoon, so I fell out of the taxi from the airport late one Saturday morning in early July and hardly moved for a week! I had one old mate to take care of, and the dog with the best ears in the business (a four-way mix of several breeds with the tell-tale Sharpei crinkle on his forehead) greeted me like an old friend. While the young girl kept a respectful distance from me for a while, you could almost see the cogs turning as she noticed her older mate approach me without fear or angst. Within five minutes she was cautiously sniffing, and within half an hour she was accepting pats and relaxed in my presence. I only had one mishap when I got up on the second day and found the dining/living area resembling a shopfront Christmas display, with the insides of two cushions liberally distributed around the room. Just on a side note, I was reminded of the relative differences in temperature around this big, broad land of Australia. While my fellow Canberrians would think nothing of an overnight low of 6C to 10C, after being spoilt in the central to far north of Queensland for two months, I went to bed that first night rugged up in jeans, jumper, socks and a beanie! 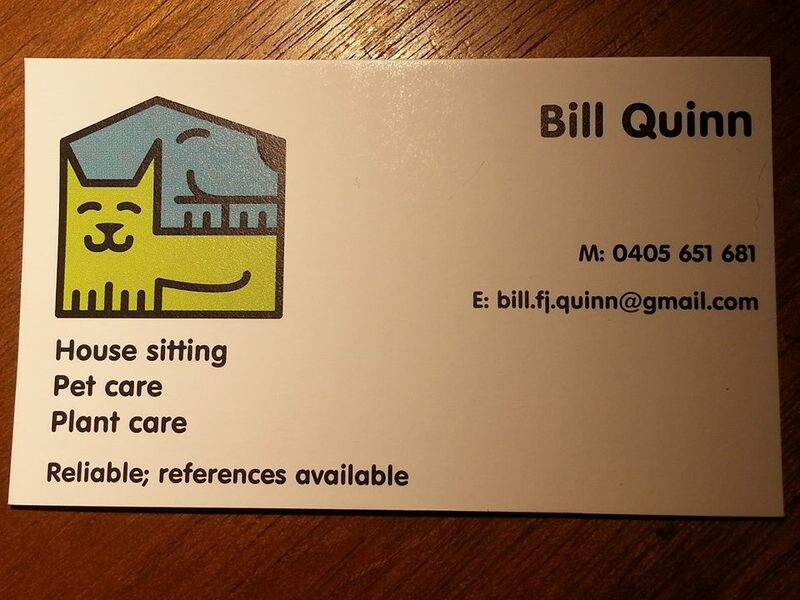 We had the pleasure of having Bill house sit for us for the second time in July 2017. Our dog Gus was very happy to see his old friend Bill again. We had welcomed a new addition to our furry family since Bill last house sat for us in 2016. Our new dog Barley can be very timid around strangers but Bill was able to win her over pretty quickly. Once again we can only say great things about Bill. He is so easy to communicate with and takes great care of the animals and the house.